Made in Maine, this men’s front pocket wallet has some advantages over the traditional back pocket style. It’s safer to carry your billfold in the front, and it can also be less stressful for your back. The curved design fits perfectly into curved front pockets, carrying both cash and cards comfortably. For added protection, it has RFID blockers stitched in. 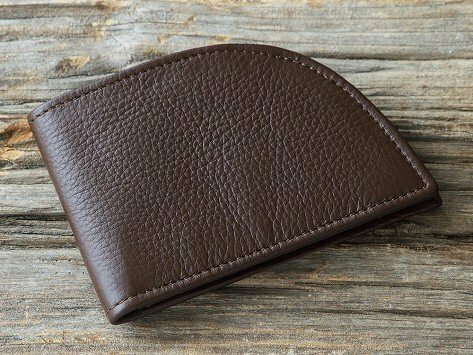 The Front Pocket Wallets are made in Maine from leather, like cow, bison, or even moose, and can comfortably carry cards and cash. And there’s added RFID protection, too. It’s safer—and can be healthier—to carry your wallet in a front pocket, and these ones are the perfect fit.